Warner Brothers is located in Burbank at 3400 W. Riverside Drive not far at all from Universal Studios (See the Universal Studios review above). This is just off of the Ventura Freeway (134) just east of where the 134 hits the 170 freeway. Their standard most popular tour is the VIP Studio Tour and is a 2 hour 15 min cart tour through the actual sets and current productions. This tour ends at their memorabilia museum. They also have a 5 hour deluxe tour for serious film buffs. Tours depart very often from 8:30am to 4pm weekdays. Warner Brothers is located in Burbank at 3400 W. Riverside Drive not far at all from Universal Studios (See the Universal Studios review above). This is just off of the Ventura Freeway (134) just east of where the 134 hits the 170 freeway. Their standard most popular tour is the VIP Studio Tour and is a 2 hour 15 min cart tour through the actual sets and current productions. This tour ends at their memorabilia museum. They also have a 5 hour deluxe tour for serious film buffs. Tours depart very often from 8:30am to 4pm weekdays. Parking is though Gate 6, the parking lot directly behind the main building. Out of all the tours we have been on so far this is the only one that requires seatbelts. After viewing the Ellen Degeneres video under the “tour” section of their website, we realize why! Watch the video and you will understand (hint: it has to do with her lack of driving ability!). There is some fascinating movie history on site of this 110 acre back lot which dates back to 1927 (under the Warner Bro’s name). Warners Brothers used to equate to Bugs Bunny and Mel Blanc but today they are a powerhouse in the TV and Film Industry. The tour starts with a sit down viewing of an inspiration video. You will then visit a number of outdoor street sets as well as explore some indoor ones as well. 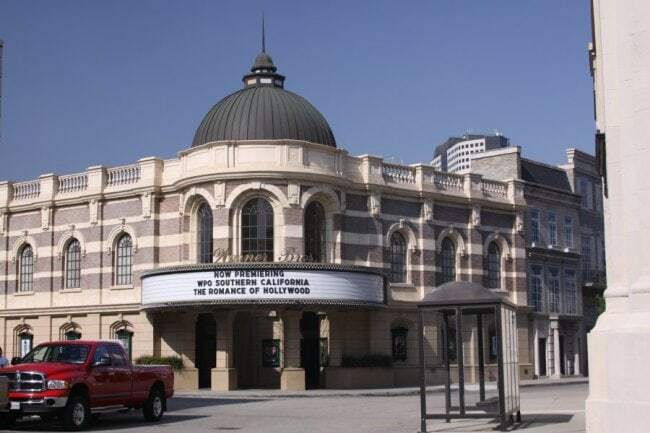 Many well known movies have filmed here including Spiderman and movies staring Adam Sandler, Tom Hanks, Paul Newman and any of a number of other famous actors. You will see the cafe that Clint Eastwood and Hillary Swank ate at in “The Million Dollar Baby” and the location for the kissing scene in the rain in Spiderman. On all the studio tours we’ve been on in LA the biggest factor for “fun” is the enthusiasm of the guide as well as the historical aspects of the studio. Warner Brothers has both. The three “E’s” for any good studio tour are in place here: the guides are energetic, entertaining and enthusiastic! The outdoor sets are a big part of the experience here. The streets are surrounded by “fake” buildings and all that brickwork you will see are just painted fiberglass. Filming a winter scene in summer? Yes they remove the leaves from the trees. Filming a summer scene in winter – back go the fake leaves, glued to the branches of the tree. What tedious work! Look for the plaques on the outside of each of their studio buildings; these list the major movies and or TV shows that were filmed inside. 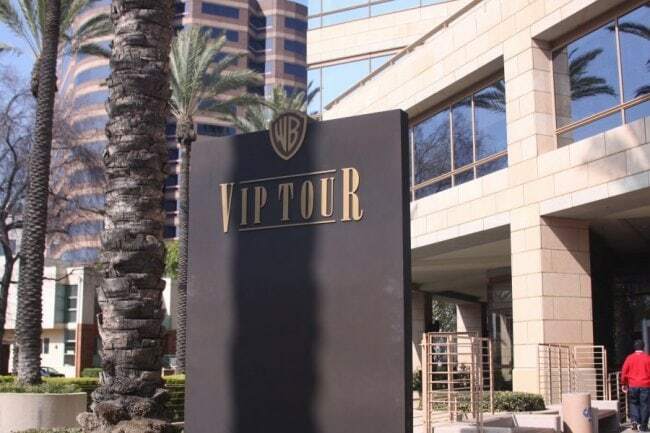 80% of what is filmed at Warner Brothers is television related. On our tour we saw several TV actors – the guides will call out their name after your tour has passed them, so stay sharp and alert! One building contains a bunch of vehicles used in movies including The Matrix, Batman and more. We’ve never seen a vehicle quite like the “Batmobile” – it is real and yes it runs…fast! You will be given a chance to pose in front of “the green screen” which as the name indicates is green…however when you see your photo you will be standing in front of some scene from a movie. One photo of your group is free. The “Friends” stage is worth seeing – this is one of the few sets that have actually been kept. This one was set to be destroyed until Jay Leno got word of it and was instrumental in helping to save it. This is now a tour favorite. See our photo of this set below.